Was Trump’s Prayer a Photo Op? Johnnie Moore, @JohnnieM, runs a public relations firm. Praying for Trump is good. Using that prayer as a photo op? Not so much. 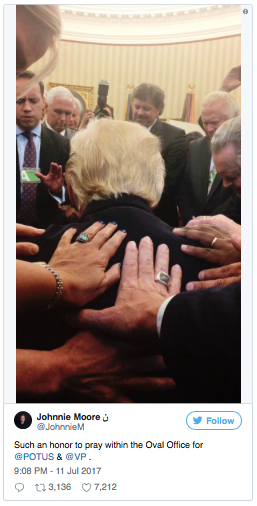 Johnnie Moore, who once managed communications for Liberty University and who now runs a public relations firm, tweeted an image on Tuesday of evangelical pastors laying on hands and praying for Donald Trump in the Oval Office. Trump is, as evangelicals like to say, “standing in the need of prayer.” He is having a difficult time on all fronts—with the lowest approval rating in history at this point in a presidency. His agenda has stalled in Congress. The Russia investigation is taking its toll. His son’s contacts with Russians are currently being scrutinized. The prayer itself isn’t the problem, though some Americans do view it as a blurring of the line separating church and state. However, we have a long history of leaders seeking support from their faith community, and Congress and our military have chaplains to minister to their spiritual needs. And unless our country changes a great deal demographically, that isn’t likely to change soon. Almost every president, like Trump, has had a spiritual adviser among his support network, and presidents regularly attend the National Prayer Breakfast, hosted annually by members of Congress. Johnnie Moore was in the room with a group of pastors, all of whom had their eyes closed as one of the pastors prayed. Johnnie, or whoever took this picture, was not praying. The photographer, eyes wide open, snapped pictures, ensuring that Johnnie had an image that could be posted on Twitter on Tuesday morning. As of this post, it has been retweeted over 7000 times. This is yet another example of the type of hypocrisy Christ abhorred. Over and over again, he condemned religious leaders who put their piety on exhibit for the world to see while they ignored the plight of the elderly, the sick, the poor. “Beware of practicing your piety before others in order to be seen by them; for then you have no reward from your Father in heaven…And whenever you pray, do not be like the hypocrites; for they love to stand and pray in the synagogues and at the street corners, so that they may be seen by others. Truly I tell you, they have received their reward. But whenever you pray, go into your room and shut the door and pray to your Father who is in secret; and your Father who sees in secret will reward you. When you are praying, do not heap up empty phrases as the Gentiles do; for they think that they will be heard because of their many words. Do not be like them, for your Father knows what you need before you ask him. Pray then in this way…” (Matthew 6: 1, 5-9, NRSV). Yes, we Christians do pray in public. Yes, we Christians do pray behind closed doors with small groups of friends, believing that, as Christ said, whenever two or three are gathered in God’s name, the Spirit is in our midst. But having a public relations firm record a prayer to show off piety seems to be exactly the kind of behavior Christ condemned. A thinking person has to wonder who invited Moore to be a part of the gathering and why. Over and over again, Americans ask how 81% of evangelicals voted for this man who was recorded saying horrible things about many people but particularly about women. How it is, they ask, that the video destroyed the career of Billy Bush but had no effect on the man who actually said those things? Not all evangelicals defend Trump or his policies, of course. Jim Wallis and his team at Sojourners spend their lives advocating for the least among us. Jonathan Merritt, at the Religious News Service, calls out hypocrisy in his writing and shows strength and courage when he is attacked for trying to bring about change in the Church. But for now they and those like them are a minority among evangelicals. As a former evangelical, I am deeply troubled that these pastors would participate in a campaign to change Trump’s image instead of his heart. But I’m not surprised. In my own experience, which led me to choose another faith tradition as a young adult, I saw many examples of men who used the Bible as a club to beat down those who dared question them. It has taken me most of a lifetime to have the courage to challenge such thinking. But if I would call myself Christ-like—which these days I prefer to the label of Christian—then I must follow Christ’s example. He challenged authority, once even losing his temper in the temple over the hypocrisy of religious leaders. I lose my temper. I rant sometimes. I find it hard, though, to call on the wisdom and courage of Christ in speaking truth to authority. But if I would call myself Christian, I can do no less. Like people in every culture, Appalachian people are complex. Why, then, do we insist on clinging to the single narrative that plagues its people and obstructs solutions to its overwhelming problems? In my 30 years of living in southern West Virginia, I had many friends and acquaintances who fit the stereotypes. But I also have lifelong friends, still living there, who do not. My favorite teacher is an avid reader and a gardener whose manicured lawn and radiant flowers were the envy of my mother, who struggled to get anything to grow in her stereotypical dirt yard. My mother’s best friend is a female lay minister in a progressive church who uses her skill to advocate for the poor and the elderly. One of my best friends is a former teacher turned small business owner, who is married to a lawyer. Another was the office manager for a United States congressman who was voted out of office when the once blue state turned red. I attended a progressive church there where the wife of a doctor spent her life engaged in philanthropic projects, not the least of which was to establish a shelter for victims of spousal abuse. The pastor at the time was a learned man with a PhD in theology—a man who later became one of the first leaders in the Presbyterian Church to advocate for LGBTQ persons. These are not the people we hear about—the people who have the credibility and the knowledge that could bring about change if given the right resources. The single narrative we hear has changed little over time. 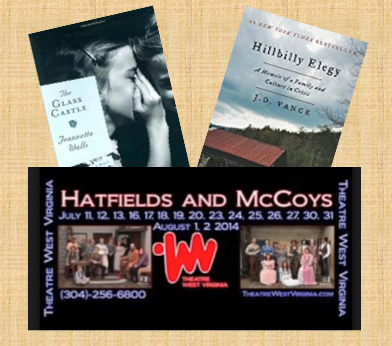 Consider that defining narrative of the early years, the story of a bitter feud between the Hatfields and the McCoys. The drama of the bloody battle between two families that threatened to engulf two states has been re-enacted at an amphitheater in West Virginia’s Grandview State Park for over fifty years. For many years, summer visitors from out of state carried that single view of the passion and violence of Appalachians back home with them as a memory of its people. Jeannette Walls’ The Glass Castle, first published in 2005, told a similar story of the poverty and mental instability of the people. Her tale of her own grit and her escape from this world remained on the New York Times’ bestseller list for over seven years, and it is scheduled to be released this year as a movie. As a child of Appalachia, I have lived among the vulnerable, those who, despite their faith in God, can’t pull themselves up by their bootstraps—those whose voices are not heard in the most well-known tales about my culture. Though the men in Vance’s story sound somewhat familiar to me, the women bear no resemblance to most of the Appalachian women I know. Even my experience is only a single story. A personal story is just that—one person’s story. The danger is when the stories we hear follow the same basic plotline and create a single perception of an entire culture. This story of Appalachian people is the single greatest barrier to finding solutions to poverty, not just in Appalachia but across our nation. Even President Obama, who I believe cared deeply about the poor from all cultures, stereotyped people in rural America during his campaign: “It’s not surprising, then, they get bitter, they cling to guns or religion or antipathy toward people who aren’t like them or anti-immigrant sentiment or anti-trade sentiment as a way to explain their frustrations.” This grave mistake allowed his opponents to use his stereotype to stoke the anger of the people he hoped to help. Over and over again, the single story threatens to become our national narrative. We generalize about every culture. We generalize about immigrants. We generalize about sexual orientation. We generalize about religions. We generalize about the media. We generalize about our elected officials. And in the end, because of these stereotypes, we can do nothing more than stand on opposite sides and lob insults at one another. We need to begin to listen to one another’s stories—to all the varied perspectives that make us a colorful and complex people. The storytellers need to avoid the urge to editorialize—to allow the stories to speak for themselves without pushing a political agenda. The story-hearers need to listen to hear, not just to respond with their own political views. This is a tall order. Like Adichie, we will not always be able to live up to this ideal. But if there is an American story, it is one with thousands of subplots. If we want to avoid a tragedy, we must outgrow our need to believe in a simple story in a picture book with an unrealistic rescue at the end. The American story is an epic, not a fairy tale.